Getting a new website is exciting. It usually means the start of a new venture or a fresh start with an existing one. Whatever the reason, you’ll probably have lots of ideas running through your head and want to get things moving quickly. Before you run off and hire the first web designer you find, you might want to take a minute. Over the years I’ve reviewed hundreds of websites and had many conversations with customers who have been burnt in the past. There are quite a few mistakes people make when getting a website and I want to help you avoid the pitfalls as best I can. 1. The final design doesn’t look how you want it to. This happens a lot. You pay for a new website, and you wait weeks or even months to see the final design before it goes live. It’s only then you find you don’t like it or it doesn’t fit within your style or branding. This is a common issue. It’s too late to start the project again and trying to change it to something else entirely can take just as long. You’ve spent money, and you’re now stuck with a design you don’t like or want. It’s not your fault, you trusted a designer and their expertise. We’ve heard this story plenty of times, and in most cases you’ll end up sticking with what you have. 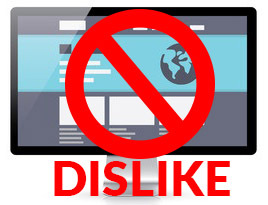 A lot of people end up resenting their website. Not much fun all-round. Before committing to a project, ask your web designer how they will prevent this issue from happening. Will they show you a mockup or at least a wire frame of their proposed design before you invest too much money? What we do to solve this problem. 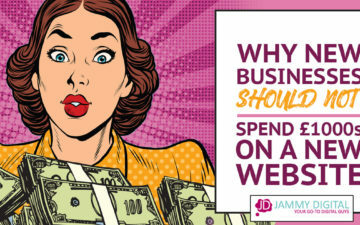 At Jammy Digital, we don’t take a penny of your money until you know exactly what your website will look like. We design a mockup of your homepage before we send you an invoice. That way, we can talk about the design together and what you like/dislike about it before we build it. If you decide you don’t like it, you can simply walk away. No harm done. Your website is live and has been for a few weeks. But there’s just one problem. You can’t find your website in search results. Maybe you’ve searched for your business name and you’re nowhere to be found on Google. Understandably, you’re a little concerned. This can happen for a number of reasons, there might be a technical issue preventing it from being indexed by search engines. 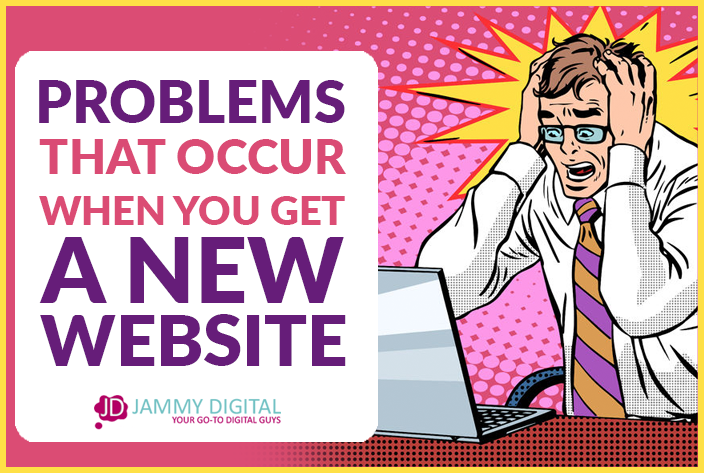 Your site might not have been released to Google or maybe there is an underlying issue with the website that’s causing search engines to ignore you. All of the websites we build appear highly in search results. This is because we use our extensive knowledge of search engine optimisation (SEO) to plan and build your website. The way your pages are laid out, the menu structure, the URLs all count towards a search engine friendly website. This means that you will already have a solid foundation to start with, even if you don’t hire an SEO company further down the road. On the day your website goes live, we create an account with Google Search Console (previously Webmaster Tools). This is the system that communicates with Google and tells them that your website is live. We then give them a list of your website pages so they can start listing them in search results as soon as possible. If there are any technical issues with your website, we will receive an alert directly from Google. That way we can address any issues immediately. It always surprises me when business owners don’t have access to update their own website. I understand if you’d rather NOT do it yourself if you haven’t got the time or skills, but still, the choice should be yours. These days you don’t need a web developer to make minor changes to your website. Most websites come with some kind of editing system which makes it very easy for you to change text and add images. Your website will continue to change and evolve, and you will need to be able to update it when you want. You really don’t want to have to ask your web designer for every simple edit. Knowing how to make changes yourself will save you time and probably some money too. Every website we design is built using WordPress. WordPress is a content management system (CMS) that makes it very easy for you to make changes. Even if you’re a technophobe (like my dad). WordPress is by far the most popular CMS and it’s used by some of the biggest companies in the world. The main reason WE use WordPress is so you can update the site yourself whenever you like. We will also send you a training video on how to make changes. You will get to log into the backoffice of your website and edit things as you wish. Over the past couple of years, search engines have made it essential to have a mobile friendly website. This means if your site doesn’t work smoothly on mobile devices (smart phones & tablets) then you are less likely to appear in mobile search results. Although your site may work on mobile devices, it may not be classed as responsive. This means that it’s more difficult to use than it should be. To check if your website is “responsive” you can use Google’s very own mobile friendly test. Some web designers treat this as an afterthought, so they don’t spend the time and effort to make an effective mobile design and opt for a “smaller version” instead. Before you hire a web designer, tell them that site will need to be RESPONSIVE – no, you don’t want a “mobile version”, you don’t want the website to be just “accessible”, you need it to be responsive. You shouldn’t really have to ask as it should come as standard. But you’d be surprised by how often I see new websites that are terrible when you use them on a mobile device. We build responsive websites that pass the Google test every time. Simple. This means that you are more likely to appear higher up in mobile searches. However, we go one step further. We build your website with a “50/50” mentality. This means that when we design your desktop site we are also considering how this will work on a mobile phone or an ipad. Your site will not only work on smaller screens, it will be user-friendly and convert more visitors into enquiries. This happens all the time. Your website is finally live and has been for a few weeks but when you check your visitor numbers you want to cry. Nothing but crickets. Yes. It can take time to build up your numbers, but there are things you could be doing to speed the process along. You shouldn’t be waiting around, hoping that it will naturally increase by itself. Ideally, you would have a strategy in place before you launch. Marketing is much more than clicking “go live” and shouting about it on social media, which is why having a plan as vital. When we take you on as a client we first spend some time understanding your business. We send you a questionnaire to fill out before we begin building your site so we can discover your goals, your target audience, your place in the market. This will help us develop a site that performs well from day one. As well as this, we also include a free digital marketing strategy session which consists of a 1 hour Skype call to enable you to get off to the best possible start once you’ve launched. This is where we’ll discuss a plan of action to increase your visitor numbers and enquires as quickly as possible. This will be a unique plan built around your business. We’ll only give you the advice that will work for you. So you have a new website which you love. There’s only one problem. How do you know if anyone is visiting it? These are basic stats that will allow you to measure your success and it’s important that you know where to find this information. In my experience, what gets measured gets improved. Every single website we build will have visitor tracking enabled. We will create a Google Analytics account and link it to your website so you can view your stats any time you like. We will also send you a free training video on how to use Google Analytics, so you don’t have to scratch your head trying to work out how to use it. If your website runs slowly, you might have a problem. 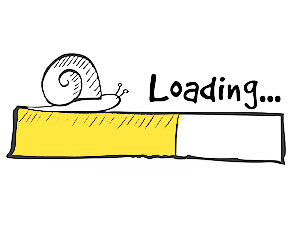 Slow loading websites can be very frustrating for your visitors who won’t stick around if they have to wait. Search engines care about their users and want to deliver the best possible experience. This means you have to keep your site running smoothly if you want the best possible rankings. All of these are contributing factors in slowing down your website. You can check your page load speed for free using GT Metrix. It will measure your load speed in seconds and will also give you a performance grade out of 100. All our websites are built to be lightweight. This means we’ll keep the site updated and free of any excessive plugins and extravagant code that may slow the site down. We’ll optimise your image sizes individually before we add them to the website so they are the smallest possible size without losing the quality. We also use a high quality hosting company to keep your website running smoothly. Our hosts come with unlimited bandwidth, 20GB of disk space, 2GB Ram and 99.9% uptime. Essentially, it means our websites are speedier than a Gazelle, and yours should be too! Getting traffic to your website is one thing, converting your visitors into enquiries is another. Your website should have one main purpose and that should be to generate its own leads and sales. Whatever your intent, if you haven’t thought about this before your website has been built then you may find it hard to convert your users. As part of our discovery session at the start of the process, we’ll find out what the overall purpose of the website is. Before we even think about coding, we will know exactly what you need from your site, meaning we build it with your overall goal in mind. This will then inspire the whole design, including the layout, the colour scheme, menu structure, images, the headlines. Everything. Before we begin building the site, we’ll design you a mockup of the homepage and record a video walkthrough explaining the different elements of the site. In this video we’ll show you how the design will persuade your visitors to do what you want them too . Take your time to find the right web designer for you. Please don’t buy based on price alone. It’s almost always the wrong thing to do. 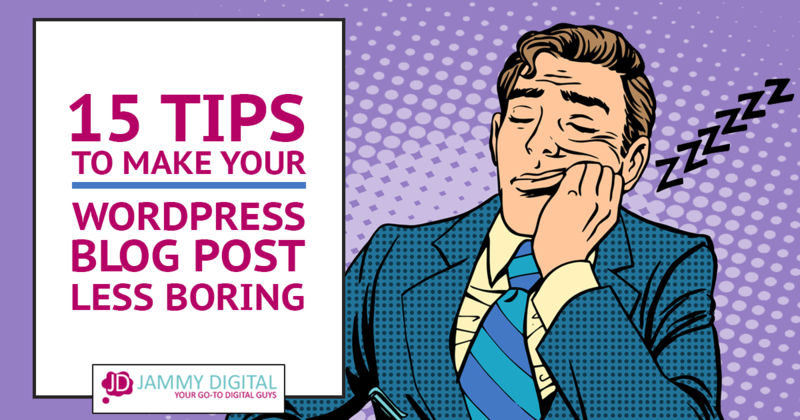 The majority of the issues in this article can be avoided as long as you find someone who really understands your business goals and has the experience to advise you correctly. Have you faced any of the problems listed above? Or have you encountered any other problems that gave you a headache. I’d love to hear your thoughts in the comments below.